I have a question on the calamus root, i Reckon its used in love spells, but what kind of intention or love spell. why can calamus not be used in sweet spells like the honey jar or marriage spells ? Calamus is used for control, so if you use it in a love spell you use it to control and dominate the other person. You can use calamus in honey jars, such a honey jar would just have a more controlling/dominating bend to it. Any substitutions for calamus root? Hi, Calamus root is prohibited in the country I live in. Are there any possible substitutions? I wanted to include it in some Follow Me Boy work. or maybe a mojo bag. It is the strongest of all the dominating herbs, right? It's absence would have a huge effect, correct? Re: Any substitutions for calamus root? Hi, Can someone please help with the difference between Calamus root and Licorice root. I know they are both used to control or dominate a person or situation but was wondering if there is a difference between them. I tend to see Calamus used quite a bit more than Licorice. I believe, but am not sure, that Licorice has more of a bite. Is that accurate? To me, Licorice is a bit nicer then Calamus (just taste them!) but they are both very potent roots when it comes to controlling others. I rarely use them seperately, they just go so well together that if I'm using one I generally use the other as well, as a matter of course. thanks, I had it the other way around. so true, though, very often you just have to look at their intrinsic properties. thank you! Well calamus is called sweet flag. In my experiences its a more subtle control and licorice is more of a stern control, but I use both licorice and calamus together most of the time. Calamus Root recipe in "Hoodoo Herb and Root Magic"
A) Calamus Root & Whiskey in the book "Hoodoo Herb and Root Magic" -- "unjinx Sexual Nature" It says we should boil Calamus Root w/a quart of whiskey and when it has boiled down to a pint we should strain out the roots and refill it w/a pint more of whiskey. to equal a quart. is finished 4) is dose define as a shot glass? Here are the links to both, for comparison. All the Best in wishes and luck! Disclaimer: This is my own personal preference if I were making the recipe that I'm answering with - others may have better XP in this area / better advice to offer you. A-1) If using root chips, I would go with 3 or 5 tbsp if my final remaining amount is a pint once the boiling is done. If I were using roots, I'd used 3 or 5 whole roots that speak to me. For unjinxing sexual nature, I'd also add some Samson snake root (same quantity) and Ginseng root (same quantity) to the recipe. A-3) A dose a day until the condition is fixed and then a dose weekly for another 3-5 weeks. After that I'd use a dose when you want Mr. Happy to happily perform. A-4) A dose would be a teaspoon to a tablespoonful. 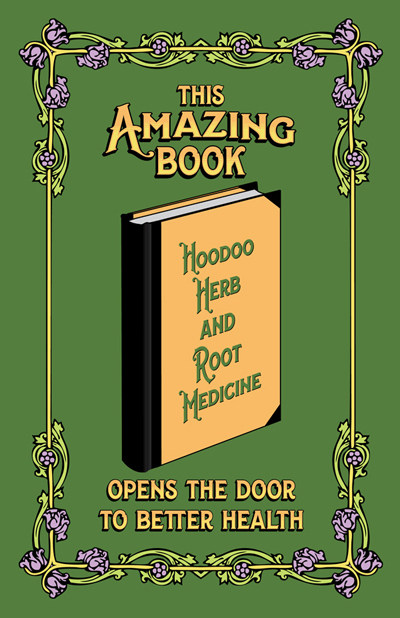 B) Your friend has given you the instructions for tincturing the calamus - this is an excellent technique if you are using the calamus medically rather than magickally. Personally, I'd use the recipe given in the book since what you're doing by boiling off the extra alcohol is concentrating the essence of the roots (magickally, not physically); that's the time you use to pray over the brew and work the spirits of the roots as the liquid reduces. Either way, keep in mind that the dosage for a tincture is SMALL - particularly if you aren't cutting it with more alcohol to dilute it - think 1/2 a teaspoon to a tablespoonfull depending on the herb you're using. C) Before using any herb internally, read up on it extensively in order to ascertain its safety, possible side effects and possible interactions with other elements in your daily diet / in the medication you take. 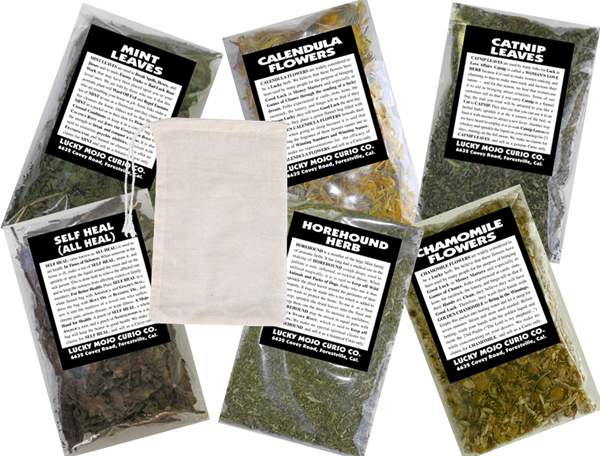 Herbs may be a man's best friend, but like a dog, if you don't know how to handle them they can wreck some serious havoc: they're potent, powerful and have a life all their own. Thank you Miss Tammy Lee for your advice, I made the adjustments right away. & hello Aura - thanks for your comment, it was sensational. 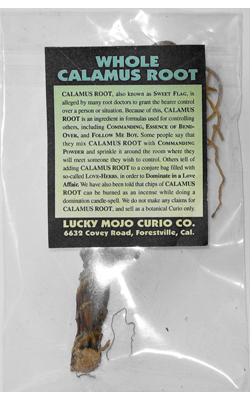 I saw that calamus root was used in Brer Rabbit's mojo hand. And that reminded me of the fact that when I lived in Taiwan, traditional Taiwanese take calamus grass (called in Chinese shi chang pu) tied together in little bundles and nail it outside their doors during the Dragon Boat Festival (during summer). The deal is, the calamus is supposed to protect the house from "summer pestilence". Taiwan can be a very swampy, subtropical country and during the summer months various diseases used to sweep though towns and villages. One of the traditional solutions to this was mounting calamus grass bundles out front. Living in the southern part of the U.S. Brer Rabbit may have been thinking along similar lines. p.s. there was also an interesting ethnic spin on this tradition. As folks may know after World War Two there was a huge influx of northern and central Chinese into Taiwan (the KMT and its army). There was deadly friction between the new arrivals and the local Taiwanese. The Taiwanese mostly have origins in southern coastal China. The "calamus nailed to the door in summer deal" was unknown to the northern and central Chinese, so if you did it you showed pride in your ethnic background as a "real Taiwanese" as opposed to one of the unwelcome newcomers. Folk magic, be it southern Hoodoo or Taiwanese Daoist, often has a political or ethnic agenda. Nice information Brian. Thanks for sharing it! Thanks for the neat information, Brian! Calamus used to be used medicinally but it is now sometimes listed as toxic. However, the reasons for this are odd -- toxctity tests using massive doses of the tetraploid strain of one species seemed to show that ingestion of calamus encouraged tumour growth -- but the isolated chemical which seemed to have caused the carcoinogenic reaction is apparently not even found in the wild diploid strains of the root -- nor will this method of preparing the root result in massive daily doses of the presumed culprit chemical. In any case, this is the way the recipe was given to me -- not as chopped pieces and not as an extract, but one root, boiled as described. A "dose" would be one teaspoon, not one shot glass. My apologies in advance if my problem is addressed in a different form as I am new to your board. 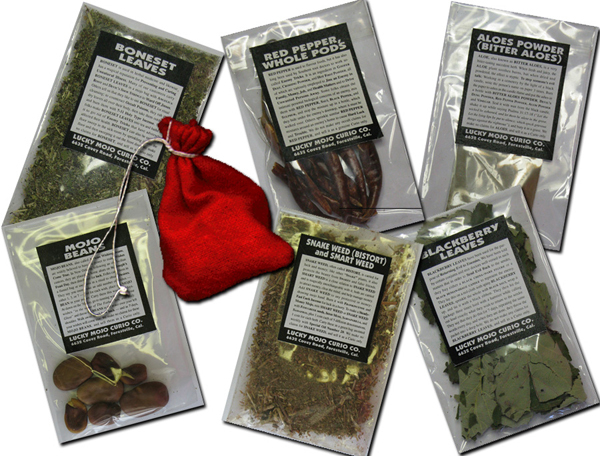 I was using some Callamus Root and Crushed Red Peppers while crafting a banishing candle. Long story short, I accidentally dropped some of the mixture in a brand new bottle of sage oil. I completed my initial task, but I feel like I ruined this bottle of sage oil. I was wondering if I might just let the oil sit with the Callamus and the peppers in it and be able to use it for another purpose later. I'm just not sure what affect the Callums and the peppers will have on the sage? Doesn't sound like a good mixture. Sage-Blessings, cleansings, purification and reversing things like the evil eye. If you can find a spell that utilizes all 3 of these commands, Id say that you might want to buy another bottle of oil.. I'm making a pair of doll babies, one male, one female: one of them is going to get the whole root, some chips, and probably some licorice root as well - but which one ? Does the one doing the controlling get them, or the one being controlled ? Yep, as usual, I'm hung up on something that should probably be evident. Thanks !! I usually put this on the one I am controlling. It's worked for me! Thanks Miss Aida ! Much appreciated ! I plan on doing something to control my long distance ex. I was just wondering if I burn a mix of licorice with Calamus would this be any good in my situation? I want control over his thoughts to think what I petition. Like him to think of me and wait for me. Also is it good to drop a few drops of Influence oil in the burn. What color candle should I use? If you are going to use controlling herbs, then I would use Controlling Oil as well. You can Use purple for conquering, mastery, and success. 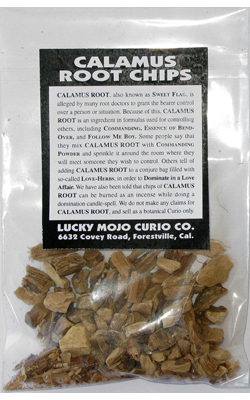 Is there a difference between calamus root and chips? Can you use one and not the other for a compelling spell? It is absolutely fine to use either/or. You'll have the same results.